"It is impossible to eat right during the holidays." If I have heard this once I have heard it a dozen times since Thanksgiving. Heck, I have even said it a time or two, but you know what? That is hog wash! The reality is you CAN eat amazing food during the holidays GUILT-FREE, and I am going to prove it to you. Take my Sweet Potato Gratin for example. To begin you will need to preheat your oven to 400 degrees. Next you will need to peel and slice your sweet potatoes. Of course you can do this by hand, but I really like using my mandolin slicer for this. I'll link the one I like to use (HERE). 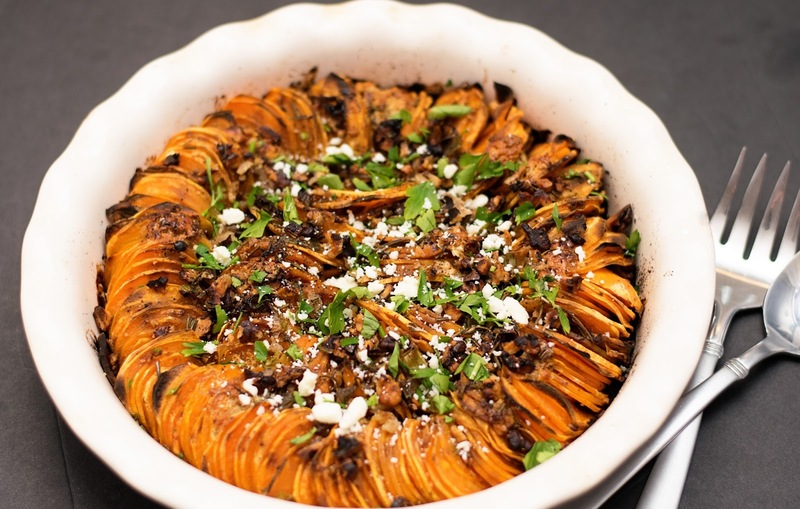 Now of course you could just lay the sliced sweet potatoes in a greased baking dish, but come on, IT'S CHRISTMAS! For a little extra pizzazz I like to stand mine upright in a round baking dish. I think it kinda resembles a wreath, and it just adds a little extra something to the dish. Once you have the sliced sweet potatoes in your baking dish, you will need to prepare the rosemary, green onion, and walnuts. Add the crumbled blue cheese to the room temperature butter and mix them together. Dot the butter and cheese mixture all over the sweet potatoes. Now you can sprinkle the rosemary, green onion, and walnuts all over the top. Between the little bit of cheese, butter, herbs, and nuts, you will get all of the rich flavor that you love in your classic sweet potato casserole without all of the extra calories. But wait! What about the brown sugar!?! What about the marshmallows!?! Don't you worry your pretty little head about that. Simply pour the pure maple syrup over overtaking. This will give your Guilt-Free Sweet Potato Gratin the delicious sweet flavor you get excited about. 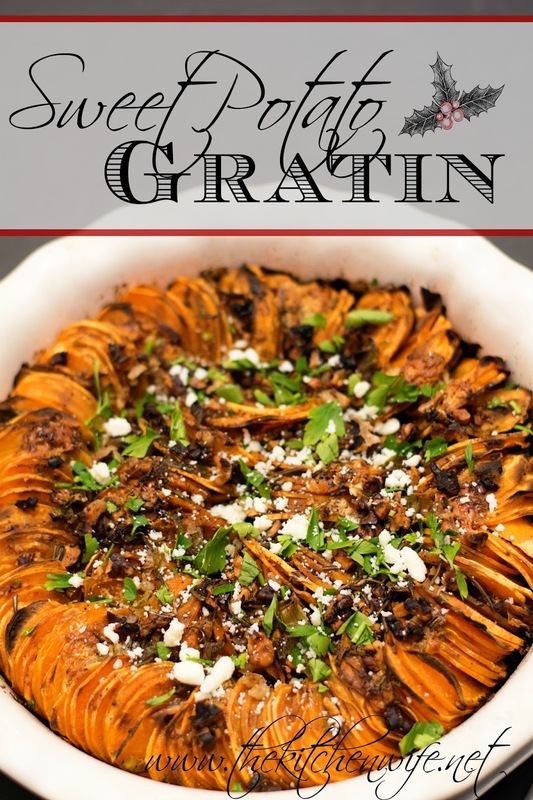 Cover your gratin with foil and place it in the 400 degree oven for 50 minutes. After 50 minutes, uncover the gratin and let cook for another 15 minutes. Look at this stunning, Guilt-Free Sweet Potato Gratin. I can't imagine ANY holiday table that this wouldn't look great on, and I PROMISE you and your family are going to devour it! I'm not saying this is 100% healthy, it IS Christmas after all, BUT a little goes a long way in terms of cheese, butter and sugar. So if sweet potato casserole is a holiday favorite of yours, but you are trying to eat healthier this year, give this option a try! Place the sweet potatoes upright in a baking dish, preferably round. Combine the blue cheese and butter into a small bowl, then dollop all over the top of the sweet potato gratin. Sprinkle the chopped rosemary, green onion, and walnuts across the top and season with salt and pepper. Drizzle the maple syrup all over the gratin. Cover with foil and bake in the oven for 50 minutes. After 50 minutes uncover and bake for 15 more minutes. Garnish with chopped parsley and a little more blue cheese.